A good filmmaker takes a movie in a certain genre and delivers what’s expected for that type of film. A great filmmaker takes a movie from a genre and gives audiences an experience outside of the conventions that we’ve come to know within that genre, thriving on the desire to challenge viewers with something that reinvigorates a story that may have some familiar elements. Steve McQueen is one such filmmaker with his latest project “Widows,” a heist film that has a lot to say and doesn’t sacrifice character development and storytelling for endless thrills. 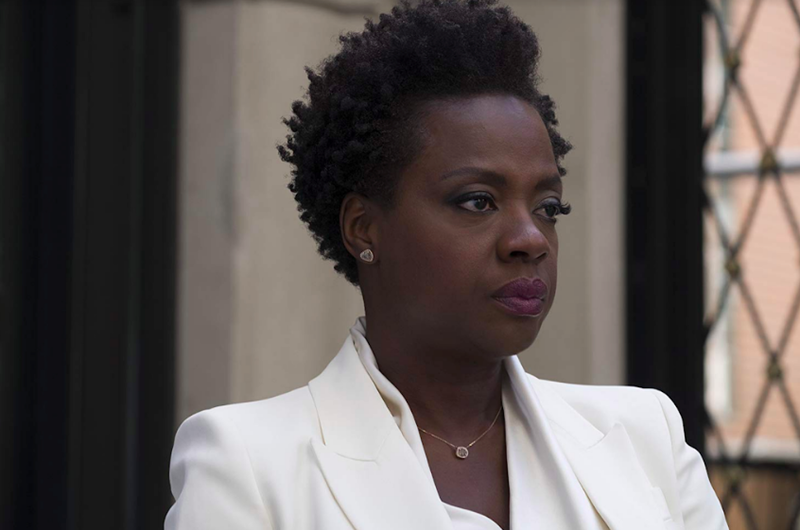 The story follows a group of women, led by Veronica Rawlings (Viola Davis), who are tasked with a heist in order to reimburse a crime boss after their husbands are killed during a robbery. Davis emerges with full force for her blazing work. Although the grief behind her character is visible from time to time, this is a role where Davis presents a tough and unflinching individual who will do whatever she can to complete the group’s job. This is an intense performance that shows a don’t-mess-with-me mentality as she takes charge of her newfound partners to ensure that they don’t run out of time for their task. There’s a scene early in the film where, while preparing to attend her husband’s funeral, she lets out an extended cry of distress. However, this is all that we see of that side of her character because after that, Davis shows that Veronica means business and can’t afford to let emotions get in the way of what she has to do, creating an understated intensity that wows you. The rest of the actresses who play the women who’re involved with the planned heist provide superb work throughout the film. Michelle Rodriguez, Elizabeth Debicki, and Cynthia Erivo all have a commanding chemistry with Davis and help make up a courageous quartet of characters who are pushed to the brink in order to survive, putting their lives in danger so they can avoid a worse fate. Even when they’re each in their separate scenes, every one of them has the talent to keep the emotions and thrills of the story alive. Outside of those four performances, there are other supporting players who also stand out, such as Colin Farrell as an idealistic, yet questionable politician; Robert Duvall as his overbearing father; Brian Tyree Henry as a fearful crime boss; and Daniel Kaluuya as his sadistic enforcer, a character of such menace that you’re put on edge whenever he appears. It’s a terrific feat to bring together a cast this big and with this much talent, but to also have all of the cast members provide top-tier performances that don’t overshadow each other is a testament to the actors and actresses that assemble for this film. The screenplay by McQueen and Gillian Flynn, which is based on the ‘80s British television crime-drama of the same name, shows an abundance of focus on each of the four women, allowing us to spend enough time with them as we get to learn about their lives. Besides the overall motive to pay back the crime boos, the movie also gives us insight into more personal motives that the women have, adding a considerable about of emotional depth that helps us become absorbed in their characters as they prepare for a life-threatening task. Aside from the deep look at the four main characters, the story is also accomplished in giving enough attention to the other narratives that take place, which helps build depth for the additional supporting roles. The film moves between each set of characters and has them meet in nail-biting ways, thereby creating tension among them that leads to a blood-pumping finale. Between these various narratives, McQueen and Flynn also interweave a few relevant themes that enrich the story and make the movie so much more than the heist. McQueen re-teams with editor Joe Walker (who worked with the former on “12 Years a Slave,” “Shame,” and “Hunger”), and Walker manages to capture the abrupt change of the women’s lifestyles right from the opening scene. His editing has this sequence cut back and forth from Veronica and her husband (Liam Neeson)’s tranquil life at home, and the heist that claims the lives of him and his partners. The quick transitions between the two scenes let us experience how fast the lives of the four main characters are altered, being thrust into a life of crime without much of a warning. With Walker’s editing, Sean Bobbit’s cinematography (who also worked with McQueen on “12 Years a Slave,” “Shame,” and “Hunger”), and Hans Zimmer’s music (who worked with McQueen on “12 Years a Slave”), McQueen is able to bring a thrill to any scene in the film. Whether it be the initial meeting between Veronica and the crime boss, or the scenes in which Kaluuya’s character shows his ruthlessness, McQueen succeeds in making us just as apprehensive with the lightning-charged, character-focused scenes, as he can with the gripping heist sequences in the film’s opening scene and third act. “Widows” fascinates right from the start, unraveling itself bit by bit as it goes on to bring us engaging characters and wide-eyed moments of suspense and surprise. It’s a movie that enlightens as much as it entertains.